Sir Alex Ferguson used the story of the Chilean miners to spur his Manchester United players to victory over Arsenal. Club chief executive David Gill said Old Trafford's VIP guests, who wrapped-up their three-day visit on Tuesday, were the perfect inspiration. 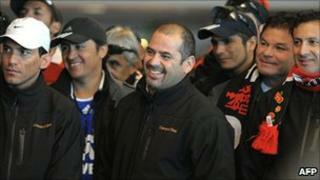 A group of 26 of the 33 rescued miners met players and staff ahead of the Premier League clash on Monday. Addressing the men, some wearing United scarves, on Tuesday, Mr Gill said the club was delighted to host them. "To see you dancing and singing in the directors box yesterday was fantastic," he said. "And you played a part in that win over Arsenal last night. I know Sir Alex referred to your story in his team talk before the game." Mr Gill said the "miracle of San Jose" had touched millions of people around the world. "It's clearly a story of bravery, courage and teamwork and the miners are a brilliant example of triumph over adversity." Miners Raul Bustos, 40, and Pedro Cortez, 25, said they were proud that Sir Alex referred to them before the game. Speaking through a translator, Mr Bustos said: "We don't feel like big stars, like the stars that play football. We feel like very normal people. We are just trying to represent Chile and the miners in the UK." Mr Cortez said he loved sport and football. He added: "I am very proud to know that Sir Alex used our story to motivate the team." The 26 miners, who include former professional footballer Franklin Lobos, were invited to the game by Sir Bobby Charlton, a director and ambassador for United. On Monday, they visited the United gym where the squad were preparing for their match against their title rivals. The group cheered when Mr Gill said he hoped Manchester United now had some new supporters.